Heat oven to 350°F (325°F for dark or nonstick pan). Grease or spray bottom and sides of 13x9-inch pan. Make and bake cake as directed on box for 13x9-inch pan. Cool 10 minutes; remove cake from pan to cooling rack. Cool completely, about 1 hour. Refrigerate or freeze cake 1 hour until firm. Tint frosting with black and blue food colors to make desired gray color. Using serrated knife, cut rounded top off cake to level surface; place cake cut side down. Cut cake as shown in template (template can be found under the Tips below). On tray, arrange cake pieces as shown in template, attaching to tray with small amount of frosting. Spread thin layer of frosting over top and sides to seal in crumbs. Refrigerate or freeze cake 30 to 60 minutes to set frosting. Frost entire cake with remaining frosting. Cut 1 colorful licorice twist into 2 (1-inch) pieces. Carefully insert licorice pieces between head and body. Cut remaining colorful licorice twist in half. Using scissors, make several cuts in 1 end of each licorice piece to form antennae. Insert licorice pieces, antennae ends up, in top of head. Insert gumdrops into sides of head for ears. Arrange fruit rings on head for eyes; use 2 blue M&M's™ chocolate candies for pupils. Separate 1 pull-apart red licorice twist into single strands. Trim 1 strand to 3 inches; place on head for mouth. Use remaining strands to decorate base of robot as desired, trimming to fit. Tie a knot in each remaining pull-apart red licorice twist. Insert knotted licorice twists in each side of body for arms. To decorate robot body, arrange 20 M&M's™ chocolate candies in desired pattern on body. Use fruit snack to form border around candy design, trimming to fit. For wheels, insert chocolate wafer cookies in base of cake. Store loosely covered. Need cutting help? Download the template. 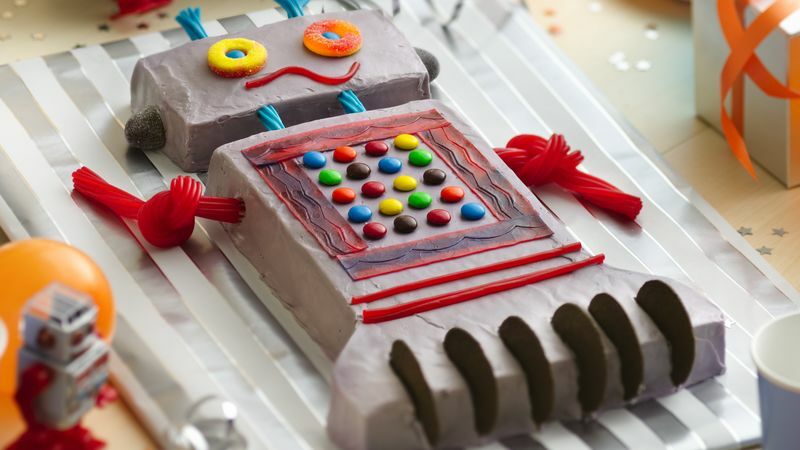 Get a party menu, prep guide, tips, party games, activities and more for a Robots Rule! Birthday Party!